I think this meal was a winner in my house. I made enough for 6 servings and after the three of us ate, there was none left. And my 14 year old stepson, who has very particular views on food these days, asked if we could have it again very soon. Definitely a success. First, cut the breasts in half lengthwise, then pound out to about 1/2 inch thick. The main thing you want is even thickness so the breasts will cook evenly. I put a plastic bag on top of the meat to protect it from falling apart. Then prepare the coating mixtures-there are two, one for dipping and one for coating (recipes follow). Dip the chicken in the liquid mixture first, then in the crumb mixture and don’t worry if the crumbs don’t stick on well. 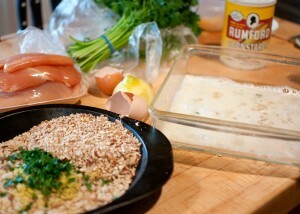 Scoop handfuls of the mixture and pile them on top of the chicken. Then transfer the chicken to a rack set over a baking sheet and air-dry the chicken for 20-30 minutes to help set the crumbs. While chicken rests, make the salad. Then saute the chicken breasts, slice and serve on top of salad. The recipes come from Cuisine at Home. Enjoy! 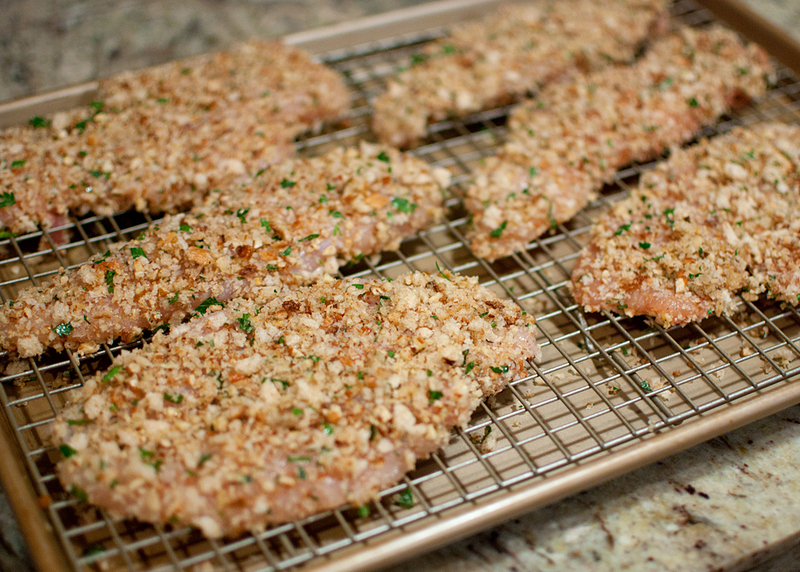 Note on bread crumbs: It’s best to make your own bread crumbs for this and it’s easy to do. You’ll need a rustic type of bread with a chewy, yet fairly soft crust. Cut bread into cubes or slices and put in food processor, you may need to work in batches. The crumbs don’t need to be uniform-they can be powdery to the size of peas. Then put crumbs on a baking sheet for 10-15 minutes in a 200 degree oven until dry, but not toasted. I did this while I was pounding out the chicken. You can freeze any leftover crumbs and you’re all set for the next time you make this. And there will be a next time! -Prepre chicken breasts by halving and pounding. -Whisk egg whites, cornstarch and lemon juice in a shallow dish for dipping. -Mix bread crumbs, parsley, salt, pepper, lemon zest, pecans, oregano, thyme, paprika and cayenne in another shallow dish, such as a pie plate. -Dip both sides of chicken in liquid mix then into the crumb mixture. 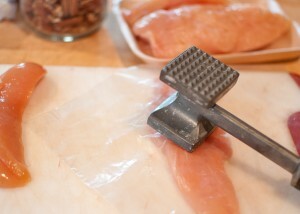 Pat crumbs on both sides of chicken-use hands to pat crumbs on and pile on top of chicken. Put coated chicken on rack to air-dry for 20-30 minutes. -Put canola oil in large saute pan over medium-high heat. When oil is hot, add chicken breasts-lay each breast in towards you so as the crumbs fall off into the pan, they create a “bed” for the chicken to rest on. Don’t worry about the crumbs that fall off, you’ll use them later. Saute chicken until golden, about 3 minutes. Carefully flip chicken and cook for another few minutes. Transfer skillet to oven to finish cooking. Roast chicken until just done, about 8 more minutes. 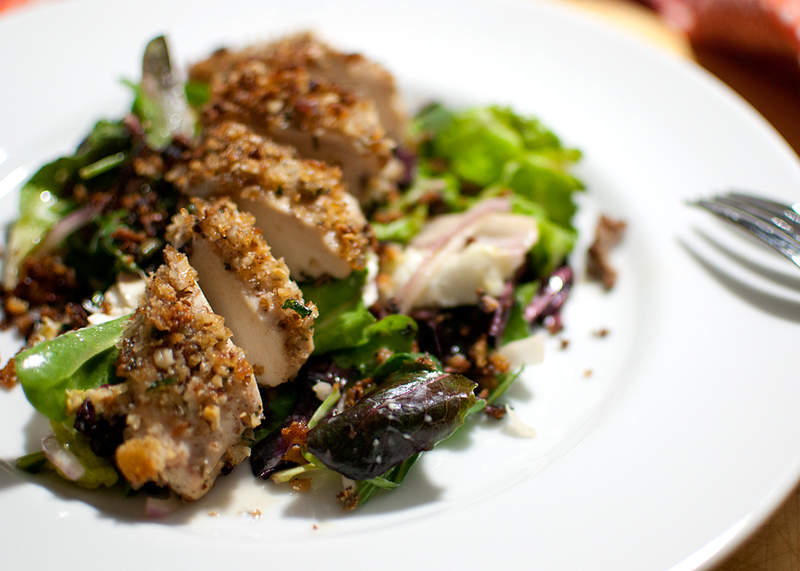 -Remove chicken from oven, slice and serve fanned over salad greens. Take the extra crumbs from the pan and sprinkle over the top for extra flavor. Serve with any extra dressing on the side. -Combine honey, mustard, shallot, vinegar, lemon juice and salt and pepper. Whisk in olive oil until combined. -Put the greens in a bowl and toss with the dressing-you probably won’t need all the dressing, so just use enough to coat the greens nicely. -Put the onions and cheese on top and toss lightly. -Divide greens evenly between 4 plates and top with sliced chicken. Sprinkle any extra crumbs on top and serve with extra dressing on the side as noted above. This entry was posted in main dish, Posts.